GOJIRA have announced details of a US headline tour with special guests TORCHE and CODE ORANGE which is set to get underway October 2nd at the House Of Blues in Cleveland, OH. Artist pre-sale tickets for the new headline dates will be available today at 2 PM, local time, followed by a Spotify pre-sale on Wednesday, August 9th at 10 AM, EST and finally a venue/promoter pre-sale which begins Thursday, August 10th at 10 AM, local time. Tickets for all dates will go on Friday, August 11th at 10 AM, local time. For tickets and more information on the upcoming tour, head HERE. GOJIRA are currently out on the road wrapping up a run of North American dates on METALLICA’s WorldWired Tour which will continue through August 16th. 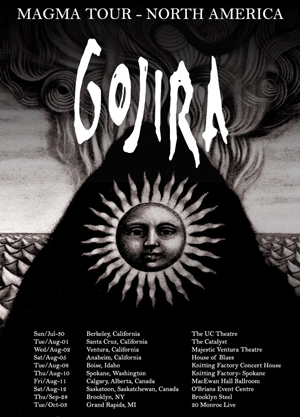 The west coast trek also includes a string of GOJIRA headline dates with PALLBEARER that run through August 12th. This Fall, GOJIRA will make an array of US festival appearances with performances set for Louder Than Life (9/30), Rock Allegiance (10/7), Houston Open Air (10/14), Aftershock (10/21) and more. The upcoming fall dates will also include a very special one night only performance with Converge at Brooklyn, NY’s recently opened Brooklyn Steel on September 28th.